Honda spawned Acura, Toyota created Lexus and then Nissan created Infiniti to compete with both of them. In 1990 Nissan Motors of Japan introduced the first Infiniti brand cars to the United States. They started with only two models, the M30 coupe and convertible and the Q45 sedan. Soon after they offered the entry-level compact G20 model for sale in the US. These cars were Nissan’s beginning in the burgeoning luxury car market. As the decade continued the Q45 attracted a solid customer base that was impressed cars standard 278-hp V8 engine that was a class leader. Infiniti also led the class in technology with such things as an active suspension system. 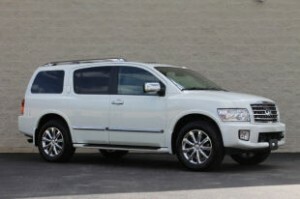 More cars were added to the line-up such as the SUV based on the Nissan Pathfinder. This SUV was built on a truck chassis giving it an advantage over other premium SUVs that were built on car platforms; off-road performance was unmatched due to its height. Sales of the Infiniti grew steadily and more models were introduced. In the 2000s Infiniti introduced the, mid-size G35 in 2003 that was an instant hit. Then using the same platform used by the Nissan legendary 350Z, Infiniti introduced the G35 coupe and sedan – instant successes! Soon after came the FX35/FX45, a SUV crossover with superior acceleration and sport-car like handling with the functionality of a station wagon. Consumers love them. The Infiniti marque is not very old, but it denotes luxury and performance and is a sought after car. If you want to own an Infiniti contact the 2011 Dealership of the year – Carson Cars in Lynnwood, Washington. Every car sold at Carson Cars is guaranteed to be running properly. Only cars that pass a rigid 111 point inspection done by an ASE certified auto technician make it to our lot. Carson Cars is family owned and operated and has been serving the Lynnwood, Bellevue, Seattle and western Washington area for more than 35 years. Call us today at 425-697-6969 or toll free at 1-888-47-DRIVE.We finance in-house so don’t let a few credit problems prevent from getting the car you want. Fill out our secure online credit application now!